(l-r) Minister of Works and Public Utilities in the NIA the Honourable E. Robelto Hector, Attorney General in the federal government the Honourable Patrice Nisbett, Permanent Secretary [PS] in the Ministry of Works Mr. Ernie Stapleton, Junior Minister in the Ministry of Works the Honourable Carlisle Powell and Director of Public Works Mr. Raoul Pemberton observing roadwork at Round Hill Estate. 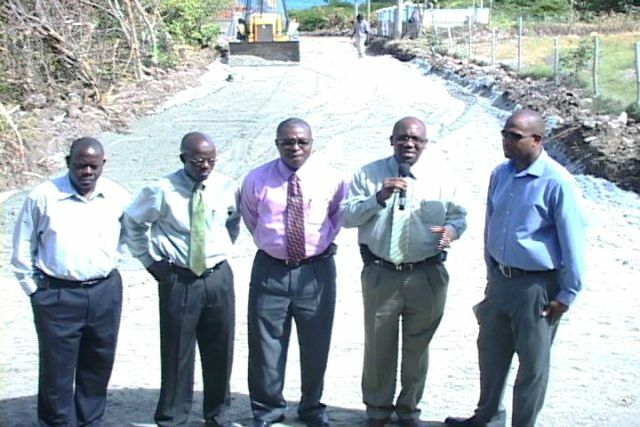 NIA-CHARLESTOWN, NEVIS (February 8TH, 2011) — St. James Parish resident, Attorney General and Minister of Justice and Legal Affairs in the federal government the Honourable Patrice Nisbett led a contingent of officials from the Nevis Island Administration [NIA], last Thursday [Feb. 3] on a status tour of roadwork within his parish. “The people of St. James would be aware that they suffered tremendous neglect in terms of their roads over the past years and we promised them that we would make the roads in the area much more passable, much more user-friendly and much more convenient and comfortable for their usage,” he said. Minister Nisbett, during his time as a Cabinet member of the NIA, “had championed a number of projects and programmes for the people of St. James’.” Such projects and programmes, he said, were “all in an effort to improve the quality of life” for his people. Speaking specifically about the road improvement project, the federal minister commended the Joseph Parry-led administration and the Public Works Department by extension, for “committing tremendous amount of scarce resources” to the area that had “molded” him into a man. “The road to development is development of roads,” he said, adding that the infrastructural enhancements would lead to “much more development” in the parish of St. James’. “Those who own property in this area, I believe that as a result of the construction of this road, their value in the investment will increase and will appreciate as a result,” Minister Nisbett explained. “Patrice Nisbett, the Honourable Attorney General, has been urging the government of Nevis please do something with the roads in St. James’. “Performance matters in a big way and there is no doubt whatsoever in my mind that the Honourable Patrice Nisbett has performed in a major way in making sure that the promise of bringing better roads to St. James’ is a promise that would be fulfilled in this the first term of the NRP government,” Minister Powell said. Minister of Works and Public Utilities the Honourable E. Robelto Hector, Permanent Secretary [PS] in the Ministry of Works Mr. Ernie Stapleton and Director of Public Works Mr. Raoul Pemberton also formed part of the tour contingent where they too assessed the level of road development thus far. While the road construction at Round Hill Estate, next to Jade Health Shop is expected to cost approximately EC$820, 000 according to PS Stapleton, the entire road improvement project in the island’s largest parish will cost EC$2 million.